OS grid reference: SD 8997 7938. 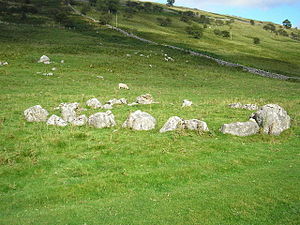 The Yockenthwaite stone circle stands by a footpath in a valley on the north bank of the river Wharfe, close to the hamlet of Yockenthwaite in Langstrothdale, and just west of the B6160 road. Buckden village is 4 miles to the south-east, while another hamlet, Deepdale, lies just a little to the north of the winding country road to Hawes. The circle is near to Yockenthwaite farm. Although many historians call it a stone circle it is actually a Bronze-Age ring cairn with a circle of small stones (kerbstones) that are still quite clearly defined. The stone circle consists of 20 small stones set almost edge to edge that are roughly 3 feet high, covering a diameter of 25 feet. These stones are, infact, the kerbstones of what remains of a burial cairn or ring cairn where a prominent tribal chieftain was buried. Just outside the circle at the north-west side are a few other stones that make up an outer, concentric ring, and a few portal stones that formed the entrance. In the middle of the circle a small mound can just be made out, which would have been the site of a burial. Originally, there would have been a mound of earth covering the stones but this has long since gone. Just to the north of the circle are what could be the remains of another burial cairn. The name Yockenthwaite is said to be of Scandinavian origins. Thwaite meaning ‘a clearing’, while Yocken could be a derivation of ‘Eogan’ of probable Irish origins – hence we get the place-name ‘Eogan’s clearing’. Thwaite is quite a common place-name is the Yorkshire Dales and also in north-eastern England giving us some idea where Norse invaders came to settle in the 9th-11th centuries. Raistrck, Arthur., The Pennine Dales, Arrow Books, London, 1972. Categories: Cairn / Cairn Circle, Stone Circles, Yockenthwaite Stone Circle N.Yorkshire | Tags: Yockenthwaite Stone Circle in North Yorkshire | Permalink.